The Alan Fleming-trained Tully East, an 8/1 chance, ran out an authoritative winner of the Close Brothers Novices' Handicap Chase. Settled in midfield early on by Denis O'Regan in the extended two-mile and four-furlong contest, the seven-year-old son of Shantou made stealthy headway under a motionless O'Regan entering the home straight and quickened clear after jumping the final fence to score by a comfortable length and a quarter from Nicky Henderson's staying-on Gold Present in second. Two Taffs, trained by Dan Skelton, was a neck back in third with Brian McMahon's Powersbomb, a further six lengths back in fourth. Fleming, saddling his first winner at the Festival for his main owner Barry Connnell, was delighted with the gelding's performance and said: "It's so thrilling - I couldn't tell you how thrilling this is. Denis was so cool on him. He is the man for the big day. What an awesome horse, awesome jockey and awesome owners - brilliant! "It was like an obstacle course out there at times but Denis is very clever and very astute to what is going on around him and gave him a brilliant ride. I can't put into words what this means." Fourth in the Martin Pipe Conditional Jockeys' Handicap Hurdle at last year's Festival, Fleming was keen to bring his charge back to Prestbury Park over fences this season, commenting: "He ran a great race here last year and it was nice to win a chase here this year. "We weren't that confident coming into the race as we have had an up-and-down season. It's been a very stop-start season but this makes up for it a bit. "He has a lot of ability, and if this horse gets a clear run now he could be very good. I'm not sure how far he can go but he has won a handicap today and he has lots of pace and lots of talent and I was very impressed with the way he jumped today. "He was super clever and I would like to run him in a graded race later this season." County Kildare handler Fleming saddles Usuel Smurfer in tomorrow's Glenfarclas Cross Country Chase (4.10pm) and Bakmaj in the concluding Weatherbys Champion Bumper (5.30pm). Fleming said of the duo: "Usuel Smurfer, if the ground continues to dry out, will run a really good race, I think the trip will suit him and he is the most natural thing I have ever seen over those obstacles. Since the first day we schooled him, he was loving it and we are hopeful of a big run. "Bakmaj is way up there with our horses when we work him at home so hopefully he runs well." Denis O'Regan added a fourth Festival winner to his record when Tully East took the final race on the first day of the Festival. 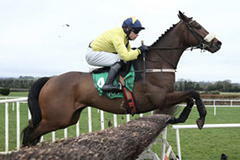 O'Regan rode Tidal Bay to win the Racing Post Arkle Novices' Chase and Inglis Drever to win the Stayers' Hurdle in 2008, and took the 2012 Pertemps Final on Cape Tribulation. He moved back to Ireland to take up a retainer with Tully East's owner Barry Connell last summer. O'Regan said: "I'm just so pleased that the horse won. He's a class horse and has been giving me that feel all year, and he has just run into a couple of good horses on the way. I was hopeful without being over-confident; we need so much luck here. He jumped, he travelled, and we had luck in the race with horses falling in front of us. "I can't tell you how much I appreciate being back in this winner's enclosure, because it is so hard to get on these horses. I'll be forever grateful to Barry Connell and his family and to Alan Fleming for giving me the opportunity to ride this horse and other good horses. And the week is only starting, but whatever happens now we can look forward to the rest of it. "I've never enjoyed a job as much as this one. I'm at that stage where I've got a lot of experience and I can handle things an awful lot better. We work well together as a team. It's great for Alan to have a Cheltenham winner - there's no better man to do the job when he's got the right ammunition, and hopefully we can build on this and maybe finish the season with a flurry." Asked what else he has to look forward to this week, he replied: "I have two good rides tomorrow - in the Weatherbys Champion Bumper, Bakmaj wouldn't have a whole lot to find on the favourite, and Usuel Smurfer in the Glenfarclas Cross Country. I've had about four goes in that race and it hasn't quite worked out yet, but it might do tomorrow."